This is the story of my struggles with humidity and mold on my boat Papoose. This page includes several tools for determining and calculating humidity, due point, and calibrating hygrometers. Enjoy the story or just use the tools. After many experiments with various ways to control moisture below, I settled on trying to maximize ventalization by leaving all hatches open an inch, and using a StorDry to encourage air circulation. This dried out most of the areas below that used to have water dripping. My humidity readings of 70% were not that much different than I got running a heater all day (expensive) and I was able to dry out more areas. With the conditions below deck in winter growing mold which was literally eating my hats, I needed to do something about the humidity below. For the mold, I washed everything down with a hose (yes, everything) and sprayed Chlorox (4oz per quart -- maybe a little strong) wearing a gas mask and wearing gloves and wiped down all surfaces. It burned my eyes but it got rid of the mold. That was at the beginning of the season. I bought one of those StorDry round 90 watt with fan low watt warm air circulators that is supposed to solve the problem. link Result, I didn't have water dripping from the surfaces so it wasn't 100% humidity below, it was only 97% according to the humidity gauge built into Weems and Plath Barometer/Thermometer/Hygrometer. That reading gave me great concern but as you will see below, probably needlessly but it lead to some good things. Hopefully, reading this article will lead to some good things for your boat as well. Humidity is moisture in the air so the first thing I did this winter was to address all the leaks that were bringing in water that had no business being there. . No use allowing more water below than what the air wants to bring in. I noticed a couple of leaks in the ports. Fixed them. I was still relying on my faulty hygrometer, which made me want to get the humidity down. Knowing that air can hold more water when hot than when dry and thus the humidity for a given amount of water in the air is lower if the air is heated, I added a 90 Watt flood lamp to bring the air temperature up. A few days later it was 52 degrees F and 92% humidity. Not good enough, I thought not knowing yet that the reading was faulty. Next I thought I would try and remove some of the water from the air chemically. I bought some DampRid closet hanging dehumidifiers. link I have had one with the coats this year and it has filled with water so needed replacing anyway. I added a second one. Result, next day no water in the DampRid pockets and the boat smelled like DampRid, same RH. That was a failed experiment. The obvious solution is a dehumidifier. Defender has one for $500. link It weighs 38 pounds and is almost the size of a case of beer. I have heard people just leave then on the dock when they go sailing -- right. For that money I can run a 500 watt heater for a year continuously. The dehumidifier isn't free to run either. The one in the link uses 385 watts so there really is minimal advantage in the climate I am in where it is cold and humid. If it were hot and humid, that would be a different story. I bought a Caframo True North Deluxe High Performance Heater. link Issue -- what temperature to run it at. From this chart, which I modified from an online chart after verifying the numbers, I picked my point at 52 deg F and 92% RH. That puts the dew point at about 51 degrees. 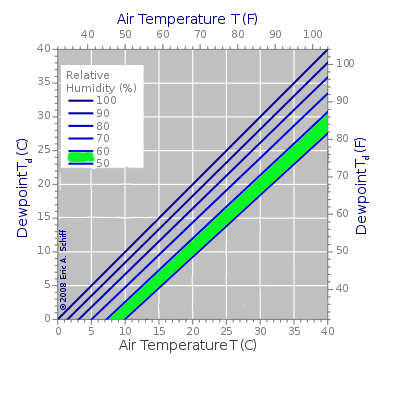 Staying on that line, as I am not going to change the dew point with my heater, I see that if I can get the temperature up to about 65 deg F I will be in my green zone (50-60% RH). That is my goal. I am charged for electricity so in the months that follow I can tell how much I am using to keep my boat dry and how good a job I am doing. 1) Choose a temperature scale. 2) Enter temperature and humidity reading. 3) Press "Calculate" to find the due point. HTML created by Brian McNoldy using the August-Roche-Magnus approximation. Using the handy calculator above, I have calculated the due points for the various readings I have taken. This can't be right as it was only 65 when I started and it clearly wasn't 97% humidity. Let me look at it another way. The weather report says the due point is 45 degrees. That is way lower than I am calculating which points even more that my gauge may be wrong. If it is 45, then I only need to get to 60 degrees to get to 60 percent RH. I need a new RH gauge. Of course, I am right at the water and the due point readings on the weather are in town. Well, these are all things to consider. Well, I can always try the old wet bulb dry bulb method. I do have a very accurate thermometer so here is a calculator to get the humidity. As a reference point, I have two humidity gauges at home. One similar to the boat one with a dial, the other digital. One reads 38%, the other 60%. The dry-wet bulb measurement I did reads 58.7. The due point outside is 43 and if it is the same inside, the RH would be 37. So, what have I learned... nothing. Good luck trying to make a wet dry bulb measurement. I started with a very good ($100) thermometer, accurate to 0.1 degree. I put a wet gauge around it and waved it back and fourth for about 5 minutes. I also bought two humidity gauges, one digital and one analog. My readings were 62.5 dry, 57.5 wet or 73.9% RH. That would indicate a due point of 54 degrees but the weather station is saying it is 45 degrees so either something is wrong or the boat air has a lot more water in it that the outside air, which I know isn't the case from the humidity gauges. The two humidity gauges read 60 for the digital one and 68 for the analog one. The boat's analog one read 83% so I was clearly chasing a bad reading. That is good news. Of course, if the new gauges are correct, then the 45 degree due point and my 62.5 degree temperature should give me a humidity of 53 percent, which nothing reads. So I went and bought another humidity gauge, one that cost 3x the others. Just before I left, the readings had settled to 61 on the digital, 62 on the analog, and 82 on the boat. Those readings are obviously very close (except for the boat) so I am thinking I am at goal. I turned the heater back down a notch and will let the gauges stabilize over night and see what they say tomorrow. I think the heater ran all the time at either setting so it wont' matter until it gets hotter. I am done buying hygrometers. What I need to do is calibrate the ones I have. Now that I have found that this can be done, that may be my next step. Place some salt (few tablespoons) in a shallow container, small ziplock container., and enough water to wet the salt so it is like wet sand but no water standing on top. I don't think it matters much how much water or salt. Place the salt/water mix in a re-sealable plastic container or bag, along with the hygrometer, and seal it. Note: make sure none of the salt/water mix comes in direct contact with the hygrometer. After 8-12 hours, check the reading of the hygrometer. It is best to read it while still in the container. The relative humidity in the sealed container with the salt/water mix should be 75 percent. If the hygrometer is adjustable, do so otherwise just write down how much you have to add or subtract to the reading to get the humidity. For example, if the hygrometer reads 73, write: "Humidity = reading + 2" It is important not to write "correct by 2 percent" because you won't remember if you have to add the 2 percent to the reading to get the humidity or to the humidity to get the reading. Trust me on that one. Of all the hygrometers I bought, the cheap analog one was the best. Luck? Not exactly. The store had about 10 of these cheap combination hygrometer thermometers on the shelf. Looking at them, they are so simple that they must be calibrated to some extent. Perhaps there is a big hygrometer on the wall and someone bends the tabs on the back until they are close to the correct value, say within 2 percent. Some are high and some are low. If they get too far off, they keep working. So I looked at all of them, noted the highest and the lowest readings, and found one that read mid way between. Worked for me, let me know if it works for you. Measured power consumption for the various settings of the heater. It was looking like I would spend $75 a month to get to my goal humidity. Given that this project started based on a faulty hygrometer, I decided to get a new baseline and I put the StorDry back on and will see what the temperature and humidity really are in a couple of days. What I now find is that there is some theory that says the amount of water in a closed up boat will increase very night as water is condensed on the cold hull until the air in the boat gets to 100% humidity. The solution is to move air around to ventilate the boat so that you keep the same moisture content in the air inside as outside. I noticed that my cockpit hatch covers were dripping with water even though I have some of those solar powered fan vents in that space. Given this I have changed strategies and am going for ventilation. I put a tarp over the boom to cover the cockpit (for other reasons) but used this as an opportunity to crack open my lazarette covers and just now opened up the engine cover in the cockpit. I cracked the forward hatch and removed some of the cover for the main cabin door. I am going for ventilation. I put the heater away and left the StorDry on. The theory on the StorDry is that it isn't trying to heat the cabin, it is just heating air so it will circulate through convection. The final experiment was to open all the storage compartments, hatches, lockers, about an inch. I left one of the cover boards off the cabin door leaving a couple square feet of open space. The forward hatch has a 3/4 inch opening letting some air in but not rain. I then left only the 90 watt StorDry running. In the morning it was 45 degrees but only 70% hunidity, about the same as I got running a 500 watt heater all day and night in the closed up cabin. I am going with this plan. Lots of ventalization and low level heat just to help keep the air moving. One of the big things I noticed was the lack of moisture in the lazarettes. These areas are usually dripping moisture in the winter. Just leaving the covers cracked an inch and they are completely dry. The way Papoose is built, virtually no additional rain water will go below even with these hatches left cracked open.